Fly through the city and discover the romantic side of Budapest. At the end of this tour, you arrive at DiVino wine bar, where you will feel like in 1001 vineyards, when enjoying a traditional cheese platter and wine tasting. Book a ride right now! 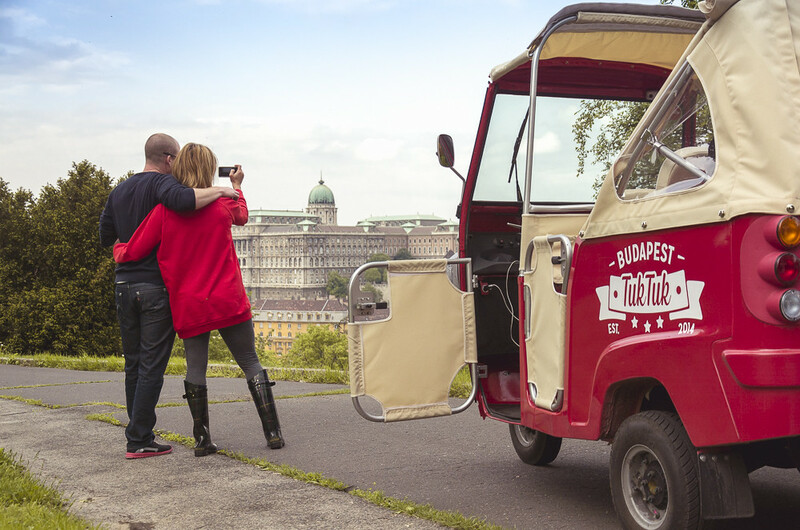 The Budapest TukTuk experience allows you to witness every corner of Budapest coming alive: your driver is also your personal guide - sit back and enjoy his stories and insights — following your interests, temperament, and pace, let us give you the memorable experience you're looking for. Whether you've already chosen places to visit, want some suggestions or a customized tour, he will be happy to drive you around and help you discover the beauty and pleasures of the life in Budapest. The Italian PIAGGIO company provides an exclusive solution for the carriage of passengers in urban environments. Design is an inherent symbol of the people of the Mediterranean Sea: a single look at these vehicles brings a smile to our faces every time we see them. Let the city talk to you!Every TukTuk is equipped with a tablet to allow passengers to access PocketGuide, the audio tour application, free of charge. And of course, you can download it to your phone! Keeping our customers satisfied is our top priority, and to provide you with the best memories we do much more than drive you through the streets! Budapest is an enchanting, vibrant city, which holds many undetectable secrets. We planned our tours very carefully to show the most, and make Budapest unforgettable for our passengers. Are you intererested in our tours? Take a look!Make your sightseeing tour a memorable joyride! Do you want to experience more than a simple sightseeing tour? Maybe a taste of the famous Goulash Soup? What about a cocktail over the city? You can do it! Choose one of our many complementary services for a memorable joyride. It’s been already a year since the first official motorcycle sightseeing service of the Hungarian capital city, the Budapest TukTuk started to travel through the city. These small vehicles operate in several European capital cities with great success. But first, we have to point out that TukTuk is not a taxi service. It does not want to compete with any taxi, rickshaw, or sightseeing bus company. Budapest TukTuk is unique in that it provides an absolutely private experience, as it transports two passengers who can decide themselves where to go or modify the planned route. Meanwhile, the driver tells them about the sights. At the TukTuk website, you can book our thematic tours that are focused on tourism and culture attractions, as well as gastronomy topics. There are currently 13 sightseeing and gastronomy tours, some of which aim at couples longing for some romance, and others at those who would like to prepare for a party night. Castle Picnic: After the 1,5 hour tour, you can take a nice walk in the Castle and enjoy a complimentary artisanal meat and cheese platter with a bottle of Dúzsi rosé vine in the Matthias Church's neighbourhood. Romantic Budapest:It's time to write a new chapter in your history. Let yourself be captured by this route’s incredible appeal through Budapest’s most loveable places. We start from the city’s heart, where small streets hiding 1000 secrets & people sing to oneselfs, than we show the river’s other side, the hill of Gellért which is a completly another word than what you saw before. After all we cruise through the Tabán and arrive at the Buda Castle where we have our unique path to discover the Palace & the Castlebazaar too. Fresh Air – Scenic View: From the heart of the city we cruise through the downtown's pulsating squares till we arrive to the top of Gellért hill, to admire a new point of view. 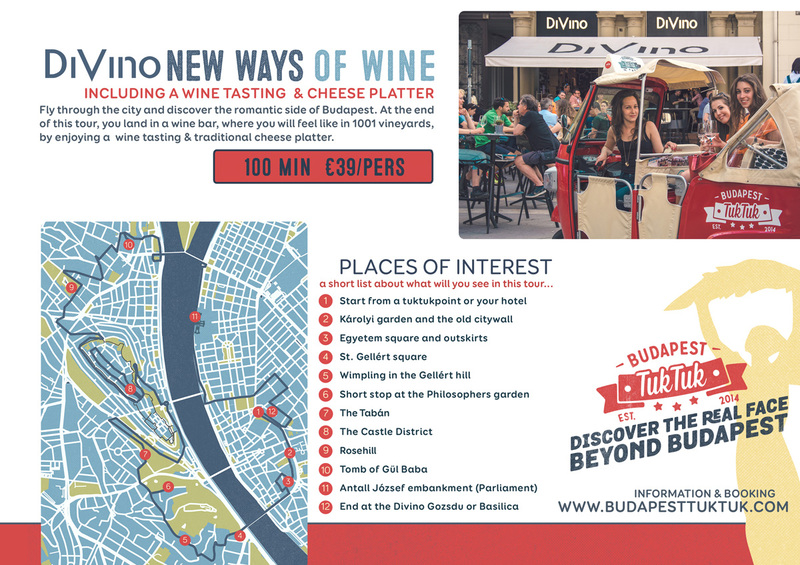 New ways of wine: Fly through the city and discover the romantic side of Budapest. At the end of this tour, you land in a wine bar, where you will feel like in 1001 vineyards, when enjoying a traditional cheese platter and wine tasting. Programmes are designed to be exciting for tourists and for residents of Budapest alike; and what is more, the opportunity of a personalised adventure is a guiding principle. The name reflects the quality service: as a sign of confidence of the city, the firm has the official right to use the name “Budapest”. “Guys were great and good fun! ”We had our Tuk Tuk ride yesterday with 3 great guys from this company! They arrived at our hotel on time and asked us where we would like to go on our tour we gave them a few places and they suggested some for us. Throughout the tour they gave us information on the city and answered any questions we had. It was great fun even in the freezing cold and the drivers clearly liked a bit of competing by racing each other and generally just being good fun! Made the tour so much better would definitely recommend to anyone visiting the city! "Great way to experience Budapest"Got collected by Adam our fantastic tour guide on time from our hotel. The tour itself (show me everything tour) is amazing you get to see a different Budapest. Not only do you cover all the major tourist spots but also the backstreet, unknown places like the old communists buildings that are now vibrant bars! Adam took time to explain the history of Budapest and also stopping at various locations to allow us to walk around for photos and scenery. Don't worry about doing it in the cold weather it's surprisingly warm in the back of the Tuk Tuk and you get a nice warm blanket. Would highly recommend this to as it is so much better than a hop on hop off bus tour and you see so much more of Budapest. Myself and friend booked a tuk tuk tour around Budapest yesterday. We were promptly picked up from our hotel and our adventure started... our tour guide Bert was brilliant, very personable and knowledgable about the history of his city. He took us to the Citadal and Liberty Statue and the views across the city and of the Danube were amazing. Our tour ended at Restaurant 21 within the Buda city walls for complimentary bowl of goulash soup. We finished our lunch with a delicious chocolate cake and liqueur coffee followed by a stroll around the palace before taking a bus back over to Pest. We had such a great time that we've booked another tuk tuk tour this evening to see the sights at night all lit up!! Worth every penny and I recommend everyone see the city using Budapest TukTuk. Throw away your paper tourist guide and jump in the TukTuk with Adam as your driver! Budapest TukTuk is the unknown and unique way to discover Budapest. You will explore the little streets of Budapest: you will see the top tourist attractions and discover the unknown treasures of the city. After a two – three hour tour, you will have visited a quite a few hotspots and have a good overview of the city. You can take this tour in almost all weather conditions, you can have an open roof or *heated* blankets! Our guide Adam was very entertaining, speaks good English and is a safe driver. I absolutely recommend this tour, it is well worth every cent! Please write an e-mail to us! Copyright © Budapest TukTuk 2014 - 2019. All rights reserved!